Creating a custom color palette can be one of the best parts of designing. The colors let you bring any look, feel or style to a space. A color board will help you layout and show the colors you choose for your palette. Today we’ve created a color board to show you how to create your own. There are a few ways you can get started on your own color board. One way to get your color board going is to base it off an already existing palette in order to build off of it or to use it as inspiration. Another way is to find a picture or image that has colors, or hues, and get your inspiration from that photo. You can pull the main colors from the photo and use them in your palette (which we plan on showing you next week). 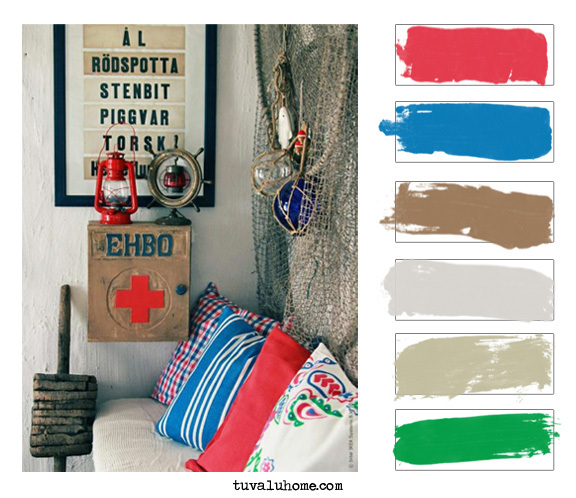 For this week’s color board we picked an already working color palette to show you how to pull colors. This way you can see what colors are present, what colors catch your eye, what colors the designer snuck in and how the colors are used in the space. Some colors, like the reds and blue, are easily noticed and pop out at you. These colors pop because the designer set them with a neutral base giving them a stage to shine. This is a great use of color in the space which you can achieve by creating a color board. It will help you visualize the layout of your colors and see how they work with each other. Don’t forget to have fun with your colors! Experimenting and mixing some unexpected colors can lead to something you’ll love!